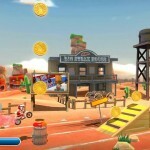 Ever wanted to play a stuntman, building dangerous tracks and taking your motorcycle for a spin ? 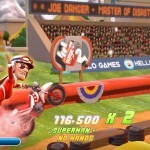 If the answer is positive then Joe-Danger the upcoming game from the indie developers Hello Games might be for you. The purpose of this game is to have fun, with it’s childish graphics it doesn’t attempt to be a realistic simulator. Hello Games was founded last year by a band of four friends who had climbed their way to the top of the pile at great developers like Criterion, Sumo, Kuju, EA and Climax. They have decided to set forth on a brave journey of discovery and adventure to bring some new, funky coloured pixels to the world. They have loved every minute of helping to create great games like Burnout, Geometry Wars Galaxies, Sega Superstars Tennis, MotoGP and Black – but it’s come time for them to forge their own path. They must unleash the charm and creativity that has been stopping them from sleeping at night. They’ve been making games since they could play them and making them together as long as they have known each other. Hello Games wants to make games that will put a stoopid grin on your face. “Hello Games have taken a less frustrating approach to the idea, basing gameplay on bonuses and combo-scoring rather than tricky obstacles. It’s easy as anything to reach the end of a track, but getting that gold trophy is going to take some Dangerous skills. It’s all about stringing together an almighty combo of tricks, flips and jumps to earn maximum points. 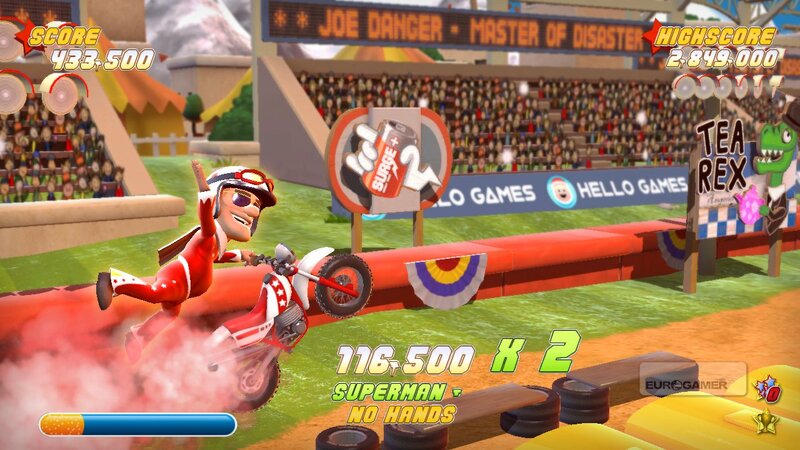 In between jumps, pulling back on the stick will cause Joe to wheelie, keeping the combo going but potentially resulting in the loss of all the points as Joe topples backwards and ends up sprawled on the floor. Players also receive power to their boost bar as they pull off tricks, which can be used to make insane jumps and stay in the air just that little bit longer. It’s technically possible to single combo each entire level if you can keep focused and keep Joe balanced. Now and again there are also green markings on the floor which indicate that Joe can switch to one of the other tracks. 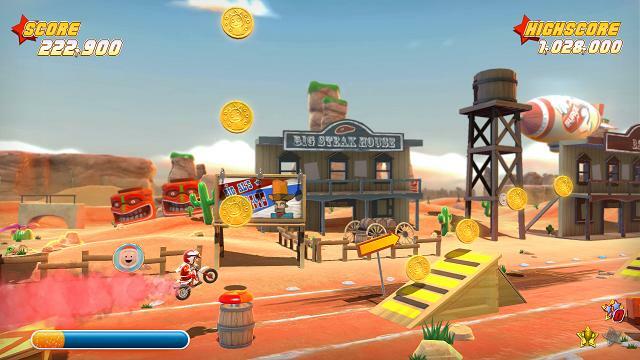 As is evident from the screenshots, each track has three different paths to ride down, and finding the perfect route through each level is bound to become an obsession for many come release day. Some routes will have tons of potential for racking up serious points, but at the cost of being that little bit more difficult to master. What I have described up to this point is but one gameplay mode available to budding daredevils – the game also features a range of brilliant gameplay types to keep you on your toes. There’s a race mode, in which players battle to claim first place against AI-controlled opponents (it’s all about maximizing the boost!). Then there’s the puzzle mode, where the key is to leave Joe at the starting line, check out the level ahead, then grab and shift all the pieces of the track around in order to allow Joe to collect the letters of the word DANGER. Pieces include the likes of ramps, springs and conveyor belts, which will either be useful or a hinderance, depending on where you place them! “Do you have a particular preference for one or multiple PC/console SKUs to release this game? What’s the ETA? PSN and XBLA are markets that have a lot of barriers to entry. We’d love to bring our game to every platform if we could. Even on PC, it’s really important to get someone like Steam on board. I guess it’s really naive, but we had this concept of, if we build it, they will come. So we just put together a PC build, then a PS3 one and an Xbox 360 [build] as soon as we got our hands on dev-kits. We’re slowly building up our list of contacts and talking to the right people, and we’ll announce our plan as soon as we can. there could be (http://counter.li.org/estimates.php) twenty-nine million linux people who might want it. Mac and Linux made up nearly half the customers but amounted to about three-quarters of the cash. Mac users are willing to pay more and Linux users are willing to pay a lot more. Regardless, I want it and am willing to pay more.